Hello friends! I had been very busy with my project work for a long time and that’s why I could not write any new post. Today I am writing this post on request of many GATE aspirants. It’s a very simple post with some basic tips, which might help you in your online GATE exam. All of these symbols are only going to confuse you. To avoid all these symbols, you need to do some paper work. You will be provided with a scribble pad for your rough work in the exam. Before starting the exam (as soon as you get the scribble pad), write the question numbers from 1 to 65 on the scribble pad which will be used to write the status/answer of the questions which you have attempted. 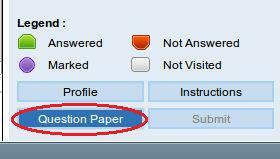 When the time of the exam starts, click on the link “Question Paper”, given on bottom right corner of your screen. Step-1. Solve the paper for first one hour and when this hour finishes, mark all the answers in the online system. Step-2. Repeat the first step in second hour also. Step-3. Now you are left with one hour. Out of this 1 hour, repeat the same process as step 1 and 2 for first half an hour and mark/write all your responses. Step-4. For last half an hour close the full paper and come to online mode (till now you were solving the paper like offline exam). By now, you will have all the questions in your mind and your responses/status on your scribble pad. Now traverse through all questions and verify your answers. If some question is still unattempted, you can try to solve that question and mark your response, but make sure that you verify all your recorded responses so that you don’t mark any wrong answer. While traversing through the questions, don’t look at the status of the questions in your system. Use your scribble pad to see that status, which will help you in saving time, because you don’t need to remember different symbols. How is this going to help you in saving your time? Since you have the practice of solving the offline exam, therefore it’s better to approach the exam in offline way. If you traverse through questions one by one, instead of opening full paper, you will become confused and you will not remember the location of the questions. But if you have full paper open in front of you, you can look at multiple questions at once and save lots of time, which you could have spent in finding out which questions you can solve easily. If you have full paper in front of you, it’s easier to go through full paper and find out which questions you should attempt first, and which questions you should attempt later. Now I finish this with one last suggestion. Don’t click on refresh button (F5) on your keyboard, otherwise your session will finish, and you may have to login again, which will waste your time and you may loose your concentration. PS: I have written the strategy, which I had used if I were giving the online GATE exam. I hope it will be helpful, but still I request you to use this strategy on your own risk. Read all the instructions multiple times before going to the exam (at least once a day for next 1 week) . I think its a better approach !! any hand books for cse to have quick review before the exam..? Good Strategy… but RISKY too. It will keep on banging your mind all the time that you have to mark the answers on the screen and more of that. If you choose to start marking the answers on sequence basis… Umm… lets say, out of n questions, on Kth question you miss one answer to mark and marked (k+1)th answer at kth question, then remaining all (n-k)th questions will be wrong. So Guys, Please take care of sequences, while marking the questions, better go for question description rather than sequences. I don’t think this is a very big risk. It’s your responsibility to take care of this thing. It also depends on, in what way you are more comfortable. Yes! It depends person to person. Actually at the time of AIEEE, I tried to follow this strategy. I solved most of the quests, ticked on question paper but didn’t fill in answer sheet, thinking I can do it all together at the end, but.. It messed up everything 🙁 🙁 so it was more of my personal threat while commenting so. That’s why I have written that keep marking the answers after some fixed interval. Dear Sir. First of all thank you so much for writing valuable and encouraging posts for Gate Aspirants like us. Sir, I would like to know your views/experiences at IISc. What are the merits of doimg M.Tech from such a prestigious institute and what should be our future target once we have completed M.Tech from such an Institute. Moreover please also give your guidance on whether should we focus on Placements or work hard for GATE when we are in III year of B.Tech. I would be obliged if you please also suggest some tips on what should we do extra in Pre-Final and Final Year of our B.Tech course so that we get an edge over others at the Interview in IISc. Thanking you in anticipation of a swift response from your side. wat about cso…..hw to study tat subject n from where? I don’t think this is a great strategy. The given symbols will actually help navigating diff questions. That is why those symbols are given. We should use them properly. Hello, Sir I am a Mechanical Engineer, but I want to appear in GATE 2015, can you provide few tips and tricks for mathematics and aptitude sections. so what to do for online practice and want to solve more and more questions . what to do for doughts ….. THIS IS NESSESARRY FOR US . I BELONG TO POOR FAMILY . SO PLEASE GIVE ME SUGGESTIONS…….THANKS..
Do not worry if you can’t solve questions. But you need to know that why you could not solve that question, which concept was lacking or what idea you could not think of. Mark it, write it. And make notes from questions too as they also teach you many concepts. Keep revising those concepts. And then after some days solve the questions again in a subjective manner. Then try to solve new questions, knowing all previous concepts, and this time also new concepts will come, mark them also. Keep repeating. And you will get those standards. dear ankur. i want to prepare for gate exam. i am in 2nd year .how to start? please help me.thank you. Please study well in 2nd year, the GATE is all about 2nd and 3rd year subjects if you are good in basics you can get good rank GATE exam. sir, i have done my engineering from C.S please suggest me some tricks to solve the questions.i remember the formulas but still not able to solve some questions……….what should i do…..
Sir, but in offline mode, they do not provide options, so it is kind of difficult for many questions to answer without options as they need options. How did you overcome this situation? Sir,How can I improve myself on aptitude part ? Sir i forgot to make all answer in green mark. I left all in violet and green tick mark. So i want to know that it is considered in marking or not?? ?plz reply…. I have chose the option ” you have answer the question but marked it for review” . It will be consider as answer or not. Plez help me. I am a CE branch passout student and want to prepare for GATE exam but comfuse because now day there are several option like go for regular classes or you may go for online coachings also which give surety for preperation in a good manner. so i would like to know that what is better online coachings or regular classes. please clear this confusion. Sir your notes are good please suggest good web site for objective questions and practice according to latest GATE 2017 CSE syllabus available on gate official web site. Nice blog. All your blog post are amazing. I regularly check your’s and kreatryx blog, i find it very useful. Keep up with your good work. I just want to get qualify in gate. What i have to do???? Nice blog. For motivation i like to read blogs of GATE exam toppers, it motivates me and also help me for my exam preparation. For such blogs you should checkout Kreatryx blogs.